Formation and composition of trans fatty acids (TFA) in corn oil during the frying process at different temperatures was investigated using an improved analytical gas chromatography (GC) method. At temperatures above 180 °C and heating times over 2 h there was a significantly increased TFA content, which increased further at higher temperatures. The amounts of trans C18:1 and trans C18:2 increased from 0.64 and 9.0 to 7.86 and 65.48 mg/g after heating at 260 °C for 12 h, while the total amount of TFA increased from 9.64 to 73.34 mg/g. However, the contents of linoleic acid and α-linolenic acid under the same conditions reduced from 460.3 and 7.4 to 209.8 and 1.8 mg/g, respectively. 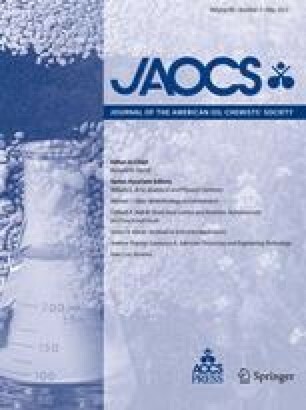 These results show that heating can significantly induce cis to trans isomerization of unsaturated triglycerides, particularly at high temperatures. The authors gratefully acknowledge the financial support provided by National Basic Research Program of China (973 Program) (2012CB720805) and State Food and Drug Administration for sample survey and evaluation of TFA in food (2008.05−2009.05).